This brief article has been composed to show you how simple it can be to turn off notification previews for your Facebook account to prevent nosey people from reading your messages. When you are signed into Messenger on your device, with each new message a preview will appear on your lock screen. While you rarely get the entire message, it still can allow prying eyes to learn who you are conversing with, as well as small pieces of the conversations you are having. Fortunately, there is a solution to keep this from happening. Once deactivated, the only notification you receive will be the name of the sender. In terms of protecting your privacy through Facebook, you should be aware that the  same option exists for WhatsApp users. Sound alerts are still going to happen with this selection made. Now that you know a little more about what you can expect with this setting modified, here is how you accomplish this feat. While there might be very slight differences, the procedure to deactivate this default setting is relatively the same for both primary platforms. Get into the Facebook Messenger app and choose the tab for “Settings” in the bottom right. Choose Notifications, then Show Previews. From here, you can turn the feature off. That’s it, now the future notifications you receive will get hidden on the lock screen of your device. You can see an example of this below. 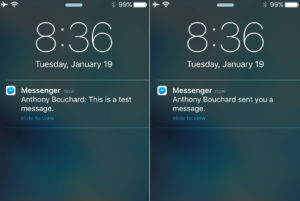 Instead of the preview of the message like you might be used to seeing, your lock screen notification might read more like “Anthony sent you a message”. Without the passcode to your phone, previewing or reading this entire message will be impossible. You might not think about it, but someone can learn quite a few things about you through the small pieces of conversation they can read from your lock screen message previews. With the preview being lengthy enough to give readers the general idea of the content of the entire conversation, your privacy is at serious risk every time that you put down your phone for a minute and step away. Worry not about your device not telling you about incoming messages, as Facebook Messenger will continue to behave in the same manner it always has, with the familiar tone and look. The only difference will be the lack of a message preview, which can help to protect your privacy. If your phone is password protected (as it certainly should be) there are no concerns about the wrong people reading conversations you are having. As always, if you have any questions or concerns, do not hesitate to drop a comment below so I can get in touch with you .